Paper is made up of fibers that come from various materials. Different types of fiber material produce different kinds of grain structures. Wood and cotton are the most common types of fiber used in commercial inkjet papers. Wood when broken down generally produces shorter fibers, while cotton forms longer fibers. 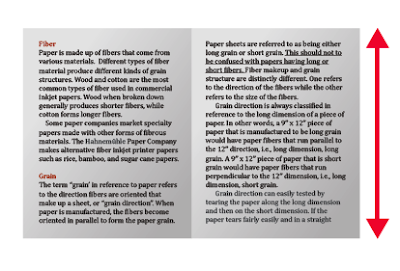 Some paper companies market specialty papers made with other forms of fibrous materials. The Hahnemühle Paper Company makes alternative fiber inkjet printer papers such as rice, bamboo, and sugar cane papers. The term “grain’ in reference to paper refers to the direction fibers are oriented that make up a sheet, or “grain direction”. 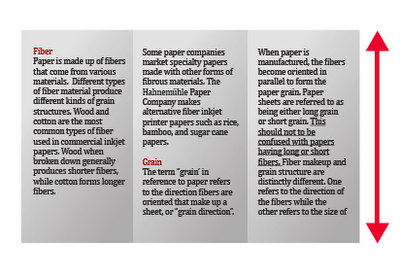 When paper is manufactured, the fibers become oriented in parallel to form the paper grain. Paper sheets are referred to as being either long grain or short grain. This should not to be confused with papers having long or short fibers. Fiber makeup and grain structure are distinctly different. One refers to the direction of the fibers while the other refers to the size of the fibers. Grain direction is always classified in reference to the long dimension of a piece of paper. In other words, a 9” x 12” piece of paper that is manufactured to be long grain would have paper fibers that run parallel to the 12” direction, i.e., long dimension, long grain. A 9” x 12” piece of paper that is short grain would have paper fibers that run perpendicular to the 12” dimension, i.e., long dimension, short grain. Pamplets are also printed with the folds parallel to the short grain direction. 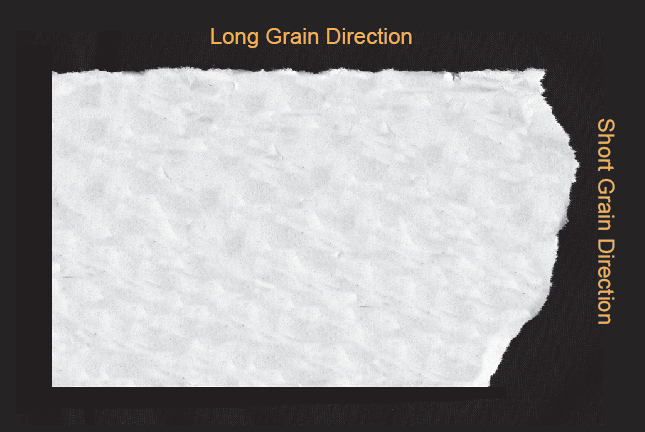 Grain direction can easily tested by tearing the paper along the long dimension and then on the short dimension. If the paper tears fairly easily and in a straight line, it was torn “along the grain”. If the tear is ragged and irregular, it means the paper was torn “against the grain”. short grain edge tears very unevenly. Fiber content directly influences the image quality and aesthetic preferences for a printed image. That’s why papers are made with different fiber contents. Stronger, harder surface papers produce a higher degree of “ink holdout”. Ink holdout refers to the degree in which ink is able to remain on the surface of a piece of paper without being unnecessarily absorbed. A high ink holdout produces a cleaner and sometimes glossier ink jet dot. So, 100% cotton fiber papers, which have a high ink holdout produce a much sharper image than say, newsprint, which has a very low ink holdout and produces a fuzzier image. Hardwood fiber comes primarily from deciduous trees. The fibers in hardwood are shorter making paper more flexible and smooth. Softwood fiber comes from almost exclusively conifer trees. The fibers in softwood are longer making paper more strong and rough. Cotton fiber is made from 100% cotton fibers. Cotton fibers are both stronger and more durable than wood pulp-based paper. Recycled fiber is made from various sources. Recycled fiber can be very high quality. Non-post consumer recycled fiber from unused repurposed paper is superior post consumer recycled fiber. Grain direction affects the ability of a piece of paper to fold properly. Paper folds best with the grain, so it is important to have the grain direction parallel to the fold. Paper that is folded along the grain will have a smooth very neat fold, whereas paper that is folded against the grain will tend to crack leaving a rough unappealing edge to the fold. Some digital paper manufacturers will specify the grain direction for the consumer. The Moab Paper Company denotes the paper as “GL” for grain long, or “GS” for grain short. 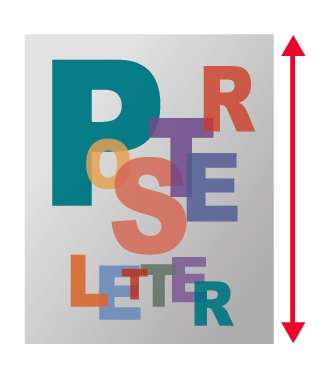 Printed materials that have folds such as books, brochures, greeting cards, etc., are prime candidates for short grain papers, while posters, post cards, flyers, etc. are best printed on long grain papers. Note: Paper coatings and surfaces will be the subject of a future post.